[k2tog, yo]: Work over 2 pegs: Move the loop from the yo peg to the k2tog peg. 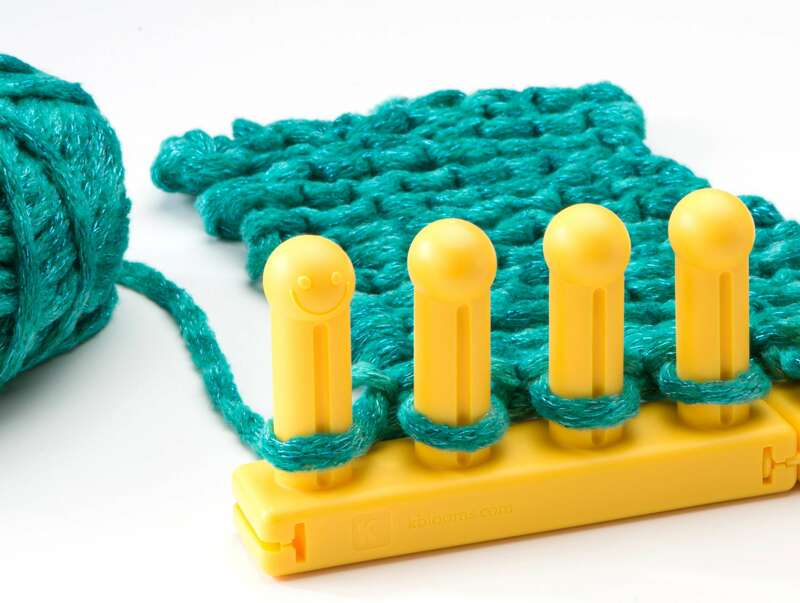 Using the working yarn, u-stitch knit the k2tog peg, knitting off the 2 loops as one, and then e-wrap the empty yo peg. [yo, ssk]: Work over 2 pegs: Move the loop from the yo peg to the ssk peg. 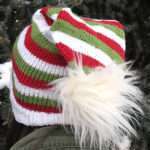 Using the working yarn, e-wrap empty yo peg, then u-stitch knit the ssk peg, knitting off the bottom 2 loops as one. —Knit the first 2 pegs of the 4 bunny ears pegs (pegs 4 & 3). —Insert a crochet hook between pegs 2 & 3 of the 4 and poke it through the eyelet directly below. 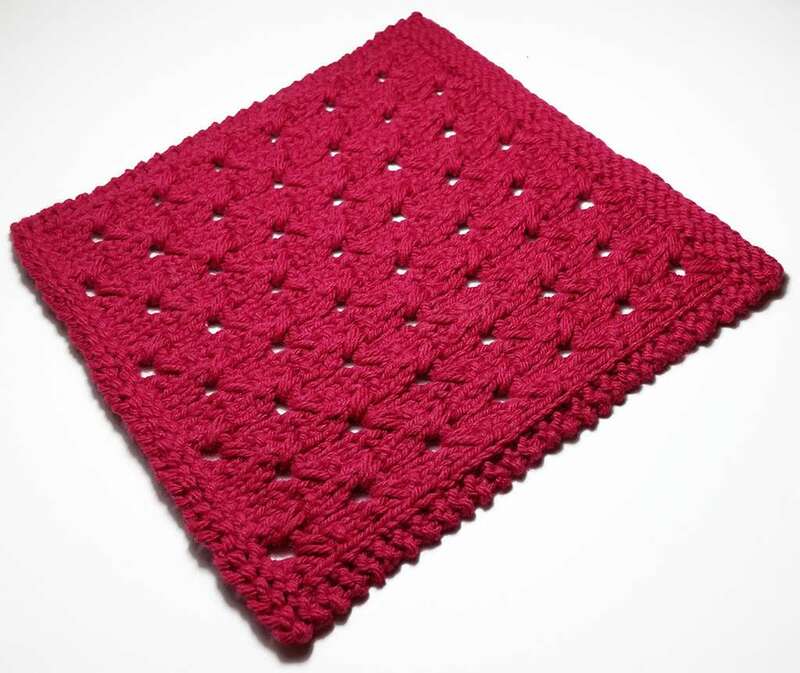 —Wrap WY around crochet hook and pull a new loop though the eyelet and out the front of the pegs. —Lift the loop 3 and pass newly made loop behind the peg. Replace the loop 3. —Lift the loop 4 and pass the right side of the newly made loop over the peg. Replace the loop 4. Cinch newly made loop in, but not too tightly. —Knit pegs 2 & 1 of the 4. 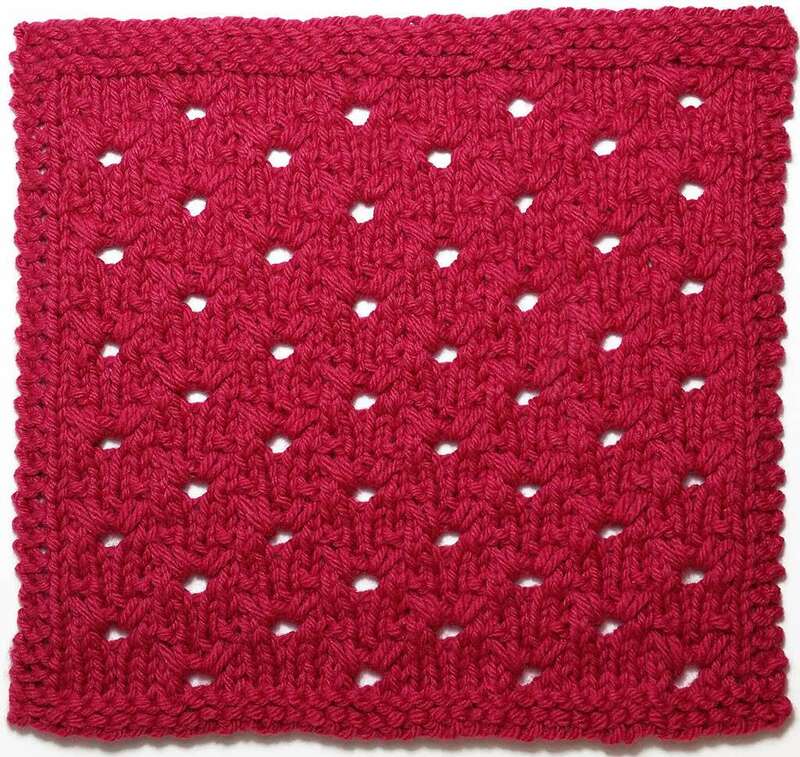 —Again insert the crochet hook between pegs 2 & 3 and poke it through the same eyelet directly below. 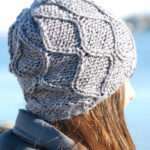 —Wrap WY around crochet hook and pull a new loop through the eyelet and out the front of the pegs. —Lift the loop 2 and pass newly made loop behind the peg. Replace loop 2. —Lift the loop 1 and pass the left side of the newly made loop over the peg. Replace the loop 1. Cinch newly made loop in, but not too tightly. —Continue with the rest of the row. —The next row will work all pegs 1 and 4 of the bunny ears pegs as 2 over 1. Make sure that these 2 pegs are worked without much tension throughout. Row 1: p1, , k2, p1, k2tog, yo, yo, ssk. Row 3: k4, make a new drop loop (see above instructions in Pattern Notes), k2, make a new drop loop. Row 4: k8, working drop loop pegs as 2 over 1. Row 5: k2tog, yo, yo, ssk, p1, k2, p1. Row 7: make a new drop loop, k2, make a new drop loop, k4. Row 8: k8, working drop loop pegs as 2 over 1. Row 5: p2, k5, *k2tog, yo, yo, ssk, k4, repeat from * to last 3 sts, k1, p2. 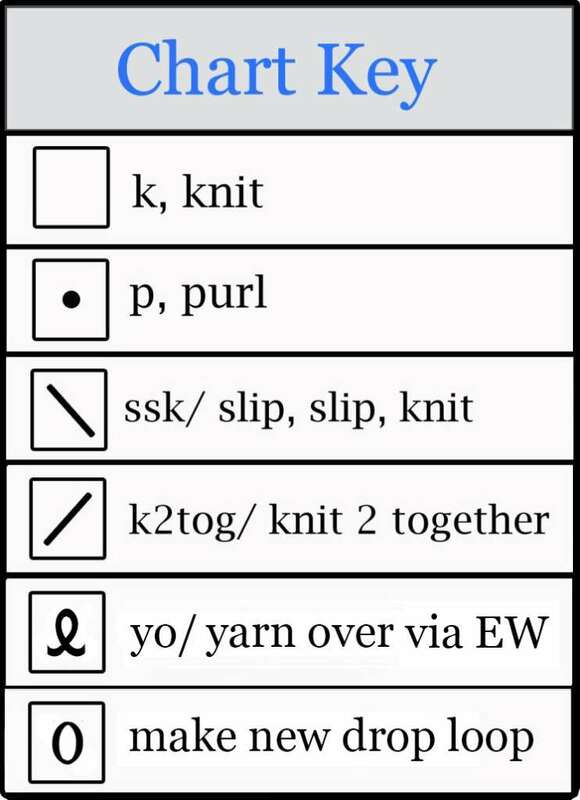 Row 7: p2, k5, *make a new drop loop, k2, make a new drop loop, k4, repeat from * to last 3 sts, k1, p2. Row 8: k38, working drop loop pegs as 2 over 1. Row 9: p2, k1, *k2tog, yo, yo, ssk, p1, k2, p1, repeat from * to last 3 sts, k1, p2. 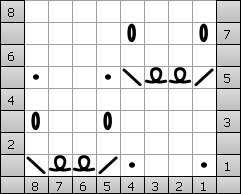 Row 11: p2, k1, *make a new drop loop, k2, make a new drop loop, k4, repeat from * to last 3 sts, k1, p2. Row 13: p2, k1, *p1, k2, p1, k2tog, yo, yo, ssk, repeat from * to last 3 sts, k1, p2. 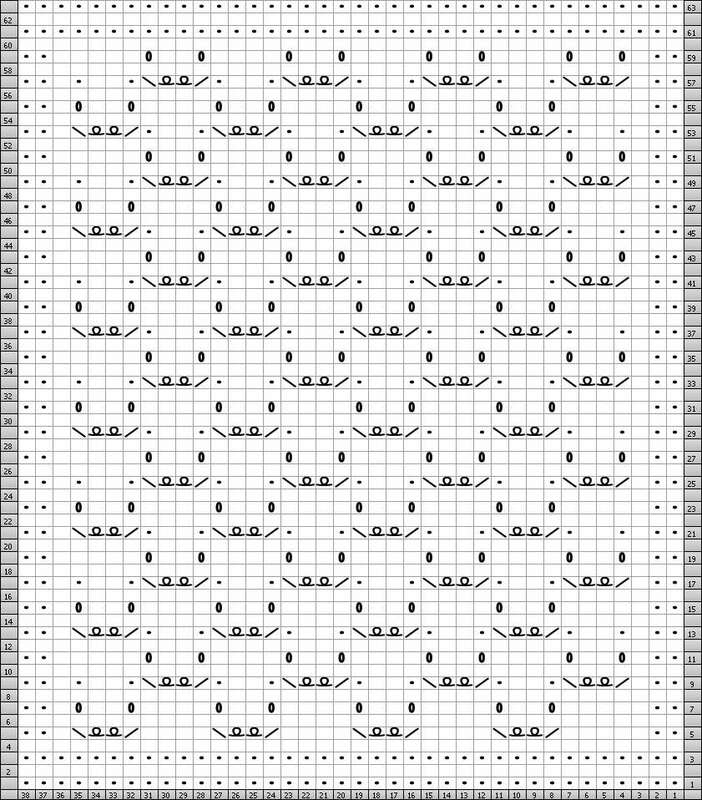 Rows 15-54: repeat Rows 7-14. Rows 55-59: repeat Rows 7-11.